In industrialized countries, preterm birth is responsible for 70% of neonatal mortality and 75% of neonatal morbidity, and contributes to long-term neurodevelopmental problems, pulmonary dysfunction, and visual impairment. In the United Kingdom, the perinatal mortality rate (stillbirths from 24 weeks' gestation and fi rst week neonatal deaths) is now less than 10 per 1000 total deliveries. In Scotland there has been a fall in the total number of live births from 60,051 in 1995 to 52,432 in 2003. In the same time period, the perinatal mortality rate has fallen from 9.6 to 8.0/1000 total births, but there has been no real change in the causes of perinatal death as shown in Tables 9.1 and 9.2 in Chapter 9. In the “unexplained <2500 g” group in Table 11.1, premature labor or preterm rupture of membranes is present in one third of the cases. 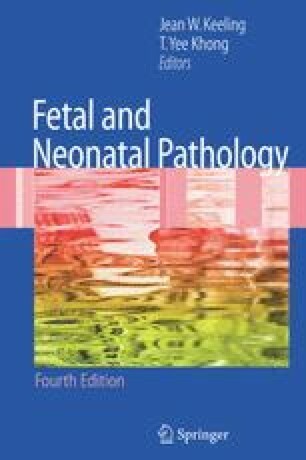 In Table 11.2, problems of prematurity are second only to congenital abnormalities as the cause of neonatal death. The latter may be infl uenced by selective termination, but any further decrease in perinatal mortality will rely on our ability to reduce prematurity and its problems. However, the proportion of babies delivering preterm (before 37 completed weeks' gestation) remains constant at around 6% of all deliveries. Preterm babies contribute signifi cantly to the workload of a neonatal unit. In Edinburgh, babies born alive before 32 weeks' gestation are 3% of the total live deliveries. They make up only 19% of the admissions to the neonatal unit but contribute 85% of the intensive care days and 52% of the total treatment days. The problems of the preterm infant are directly related to gestational age, as this determines the functional immaturity of the systems of the body. Birth weight is related to outcome because of its close relationship to ges-tational age but also, at any gestation, survival is better among heavier infants (Piper et al. 1996). The poorest outcome is seen in infants with birth weight more than two standard deviations from the mean for that gestation, that is, those with marked intrauterine growth restriction.